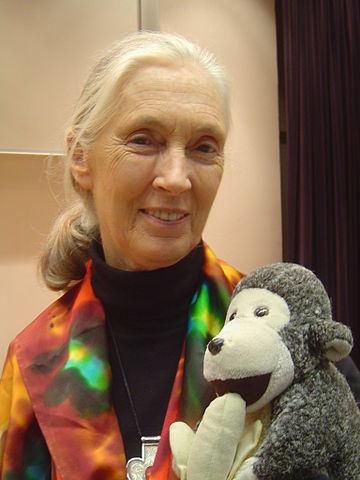 Jane Goodall in 2006. Photo by Jeekc. Creative Commons Attribution-Share Alike 3.0 Unported. I recently came across this fascinating collection of letters by primatologist Jane Goodall: Africa in My Blood: An Autobiography in Letters. The Early Years (Houghton Mifflin). The bulk of the letters, however, focus on the first several years of Goodall’s work in Africa–including her arrival in 1960 at the chimpanzee reserve now known as Gombe Stream National Park (in Tanzania) and her discoveries that chimpanzees eat meat and use tools. The odd thing is that he knows it’s evil, when he steals these things. I have a new haversack made in Kogoma. Three times already he has tried to take it. He always says “hoo” in an aggrieved way when I say no and hold onto it! Anyway, this morning after his bananas he looked so melting sitting there that I resolved to get him one from the bunch I had hidden in the tent. A shriek from Dominic who was making my bed warned me—too late. William had taken my haversack from the table and was dragging it off, bumpity bump, into the bushes. In it was my camera. Also the 300 and 150 mm lenses. Also exposure meter and my last 5 KII films. Well, I yelled at him and just charged after him. He dropped it just before getting to the bushes opposite the tent. Now this is the amazing thing. I told you he knows it is wrong—I quickly followed him with a banana, but was afraid that I might have scared him badly. Not at all. He came up at once, though he did pause and say “hoo” in a rather defiant way before taking it. And came out again, bold as ever, to try and push me off the box to see if there were more inside. Which proves most positively that he recognized my right to get my property back. He is a real menace—a real cleptomaniac. Another volume, Beyond Innocence: An Autobiography in Letters. The Later Years, follows Goodall’s life and career from 1966-1999. This entry was posted in Jane Goodall, primate research, Uncategorized and tagged chimpanzees, Gombe Stream National Park, Jane Goodall, letters, primate research, science, Tanzania by Susan Frith. Bookmark the permalink.